Francisco de Zurbarán (1598-1664) was one of a handful of masterful Spanish painters to take inspiration from the revolutionary style of shadows and light and realism invented by Caravaggio. Along with Ribera, Murillo, and later Velazquez, Zurburan is part of an elite group of ingenious Spanish Baroque painters who form the core of what became known as the Golden Age of Spanish Art. Zurbarán combines the drama of the Baroque, in terms of dynamic moments and theatrical painted lighting, with realism and the Catholic mysticism that has always been a part of Spanish artistry. His themes were almost all religious, and he received particular acclaim for a number of highly-realistic depictions of monks emerging from shadows. 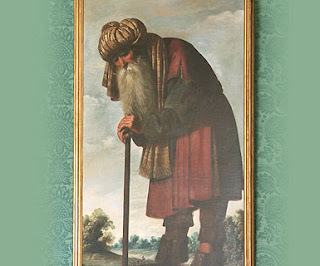 Zurbarán was born to a Basque family in Fuente de Cantos, in the Badajoz Province of Spain. He studied painting in Seville, and worked first in Llerena, before settling back into Seville in 1629, where aside from two years of his life (1634-1635), when he painted at the royal court in Madrid, he would live and work until 1658. His popularity as a painter starting to wane, Zurbarán left Seville for Madrid, where he lived out the last decade of his life. Zurbarán’s earlier works show the influence of Caravaggio, and the Tenebrist post-Caravaggio style taken up and made new by Ribera and Velazquez. Zurbarán’s work developed more along the lines of his fellow Sevillan and contemporary, Murillo (see entry number nine in this museum), who was wildly popular. Many critics agree that the move away from the Caravagesque and more toward the occasionally-cloying sweetness of Murillo was a shift for the worse, choosing popular sentimentality over high drama and action. Zurbarán’s work has been the subject of high-seas adventure. In 1756 an English ship seized cargo from a Spanish vessel, that was carrying the thirteen paintings by Zurbarán, a complete series depicting the Old Testament Jacob and his twelve sons, painted 1640-1645. The captured paintings were offered for sale in England. Richard Trevor, the Bishop of Durham (1707-1771), bought twelve of the thirteen paintings for £124. But the Bishop was foiled in his attempt to buy the complete series, as the portrait of Benjamin, Son of Jacob was snapped up by Peregrine Bertie, Duke of Ancaster (1714-1778) before the Bishop made his bid. The Bishop of Durham commissioned the artist Arthur Pond to paint a copy of the Zurbarán Benjamin (seen in the image above), as the Duke of Ancaster refused to sell, quite pleased with his purchase, albeit of captured art. In 2001 the Church Commissioners planned to sell the series of twelve paintings, today worth an estimated £20 million (a nice profit from £124). As there was a public uproar, they determined to keep the works and re-evaluate their own financial straits in 2010. But do they own the works, after all? If the paintings were seized from a Spanish vessel, rather than having been legally purchased, and then sold on, who has the current rightful title? The original Spanish owners? The Spanish government? Or did all this happen so long ago, that the current English owners should retain the rights? 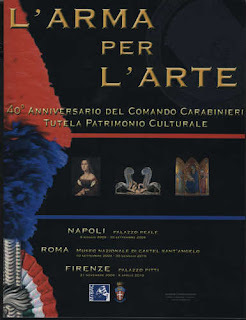 To celebrate 40 years of success against art crime, the Carabinieri Division for the Protection of Cultural Heritage and Italian Ministry of Culture has planned a series of major exhibitions, in Naples, Florence, and Rome, throughout 2009. Established in 1969, the Carabinieri Comando per la Tutela del Patrimonio Culturale was the world’s first dedicated art squad, established in response to a rash of thefts on the part of Organized Crime throughout the 1960s, culminating in the 1969 theft of Madonna’s Nativity from the chapel of San Lorenzo in Palermo, Sicily. The Caravaggio, thought to have been stolen by the Sicilian Mafia, is still number one on the list of world’s most wanted stolen art. The Carabinieri are far and away the largest and most effective art police force in the world, with over three-hundred full-time agents. They also have much more to deal with, as Italy has nearly ten times as many art crimes reported per year than any other country. The Italian government has been one of the only governments to take art crime as seriously as the crime warrants, and to dedicate sufficient resources to the art police. Most countries have no dedicated art police, and those that do tend to be under-funded and receive insufficient support from their governments. 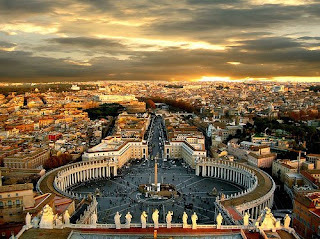 Exhibitions of recovered masterpieces will be held at the Palazzo Reale in Naples, the Museo Nazionale di Castel Sant’Angelo in Rome, and the Galleria Palatina in the Palazzo Pitti in Florence. An exhibition catalogue, entitled “L’Arma per l’Arte,” will also be published. Reviews of the catalogue and exhibitions will appear in the Fall 2009 issue of The Journal of Art Crime. ARCA is proud to support Italy and the Carabinieri, and would like to congratulate founding trustee Col. Giovanni Pastore of the Carabinieri for his efforts throughout his career. ARCA is also pleased to award Gen. Giovanni Nistri of the Carabinieri, with the 2009 ARCA Award for Lifetime Achievement in Defence of Art. The 2009 ARCA ArtGuard Award for Art Protection & Security will be presented to former Italian Minister of Culture Francesco Rutelli, at the awards ceremony at ARCA’s conference this July 11 in Amelia. 8 May 2009: Professor Noah Charney, a world renowned expert on art crime, comes to AUR for the fall 2009 semester fresh from a run at Yale University where he just offered a highly successful course on the subject. His course AH 283 - Traffickers, Thieves And Forgers: Art Crime will meet for thirteen Wednesday evenings beginning on 9 September from 6:15 to 9:15 pm in the Auriana Auditorium on Via Pietro Roselli on the AUR campus. The first lecture is free and open to the public. Those wishing to take the course for credit, as an auditor or as an attendee will be able to enroll at the first class. Art crime has evolved from a relatively innocuous crime of passion carried out by individuals (often for ideological as much as financial reasons) into the third highest-grossing criminal industry in the world. 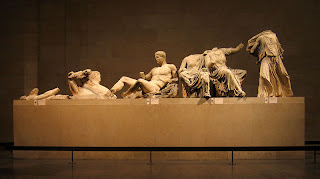 Today’s art thieves are usually connected to organized crime and stolen art and antiquities are used to fund drugs and arms trafficking and terrorist acts. Professor Charney’s course will explore the history of art crime and its impact upon our society. It will also examine how art can be protected and recovered. Noah Charney holds advanced degrees in Art History from the Courtauld Institute in London and the University of Cambridge in Great Britain. He has worked closely with law enforcement agencies across Europe to study the phenomenon of art crime and is the founding director of ARCA (Association for Research into Crimes Against Art) www.artcrime.info. Recently a Visiting Lecturer at Yale University, he has just joined the faculty of the American University of Rome as Adjunct Professor of Art History. ARCA is pleased to present a series of researched editorials written by students of ARCA Director Noah Charney at Yale University. These students were enrolled in Charney's seminar on art crime in the Spring of 2009. The Elegan Marbles and the Machu Pichu sculptures at Yale pose vexing questions of how to determine art’s rightful owner, after it has belonged to many owners in many countries through many conflicts over many years. We suggested several criteria that could help determine art’s ultimate owner: its history of lawful ownership, the decision of an neutral international body, or “the best interests of the art.” I want to explore what those interests could be, using “the best interests of the child” standard in family law as a suggestive example. These factors suggest what decision-makers should consider when determine who should get ownership of art. Obviously, paintings are not children; art has no interests of its own. But people affiliated with the art have interests in the art. The current owner of the art has an interest that the art not be removed from its collection. Current and past owners of the art have an interest that art be safe: that it is minimally vulnerable to weather, fire, theft, and vandalism. These parties have an interest that the art be in well cared for, which means it is cleaned, preserved, and protected as much as possible from the decaying effects of time. Artists have an interest that art be displayed, marketed, or performed according to their intentions. Society has an interest that the art be accessible to the public, and the owners, if they are museums, have an interest that the art is accessible to scholars. When a country can validly claim that a piece of art constitutes its cultural heritage, that country has an interest in the art being displayed in a place and manner such that citizens of that culture can appreciate the cultural significance of the art. Like the emotional ties and relationship between parent and child, the cultural ties and relationship between a country and a piece of art should count in determining where the art ends up. A decision-maker should evaluate which potential owner would best satisfy these interests. In what hands will the art be maximally safe, accessible to the public and scholars, displayed as the artist intended, and able to function as a piece of cultural heritage? When these interests conflict – when, for instance, the Machu Pichu sculptures will be safer and more accessible to scholars at Yale, but better be able to serve as cultural heritage in Peru – decision-makers will have to determine which factors are more important. The security of the art should be the most important consideration, since everyone loses if the art is destroyed or vandalized. Decision-makers may wish to disregard certain factors in making their decision. In the family law case, Connecticut has said that the socioeconomic status of a parent should not play a role in determining child custody. Similarly, judges may wish to consider a country’s material no more than necessary in determining art’s ultimate owner. Though the wealth of a country influences its ability to protect and display art, it does not affect the significance of the art in that country’s culture. Directing decision-makers not to consider a country’s GDP (except as it relates to safety and security) may avoid charges of paternalism. Determining the best interests of the art is complicated. Art has many more owners than children typically have parents, and each of these owners has their own set of interests, which must be weighed against each other in a complicated equation. It is also unclear the extent to which society has an interest in art it does not own, since future generations could benefit from the continued existence of the art even if they do not own it. Despite these complications, the family law standard of “the best interests of the child” begins to suggest factors that will help us determine which potential owner will serve the best interests of the art.